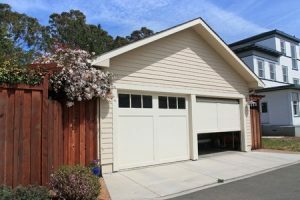 We all know to lock our doors, but for many homeowners, the garage isn’t nearly as safe as it could be. Burglars can often get inside just by working wires inside and pulling it open – or worse, by breaking into your car and stealing your garage door opener. It happens more than you might think – as part of a study to determine actual risks to homeowners, Nationwide Insurance found that 9% of break-ins happened through the garage. That may not sound like too much at first, but it’s important to remember that many burglars will try several methods of entry – in many cases, garage break-ins occur when homeowners remembered to secure their doors and windows but forgot to properly secure their garage. With that in mind, here are some home security tips to help ensure your garage is properly secure. Many garages come with windows these days, and while letting some natural light in can be a delight while you’re working on something, windows also serve as another point of entry and give burglars a chance to see if your garage is worth breaking into. If they think it is, a break-in is often just a matter of time. Opaque curtains are ideal, but you can also apply various kinds of film to the glass that will let light in without allowing others to see in. Appropriately-sized films can often be purchased for $20 or less, and the added security is more than worth the cost. If you have a remote opener for your garage, don’t just attach it to your car’s sun visor for easy access. It’s best to keep it on your keychain so you’ll always be able to take it into your house, but if you absolutely must leave it in your vehicle, be sure it’s not kept anywhere visible from the outside. Many homes have keypads to open and close their garage doors, but far fewer have timers that automatically shut the garage door after a certain amount of time has passed. This is a particularly important part of home security because most people who leave their garage doors open don’t know they’ve done so – and it only needs to happen once to let a break-in occur. Most timers have adjustable settings, but we recommend setting the timer for no more than five minutes at most. One of the most common ways of breaking into a garage is using a coat hanger to sneak inside and pull the emergency release, which pops the garage door open. A burglar who knows what they’re doing can accomplish this in just a few seconds – fortunately, it’s easy to stop this trick with one of your own. By putting wires through the two holes in the garage door carriage system associated with the emergency release system, you can ‘lock’ it and completely stop thieves from breaking in with this trick. You should only do this in a way that can be easily removed from the inside. Emergency release systems exist for a reason, and making it hard to use is never the correct course of action. Practice ‘locking’ and ‘opening’ the system several times to be sure you can do it quickly in an emergency. There’s no way to completely prevent a break-in, but tricks like these – when used alongside a full home security service – can drastically reduce your risks and potential losses.